“Where are your products made?” People often ask. “They are made in China.” I’d reply with confidence. I get a lot of varied reactions to that. 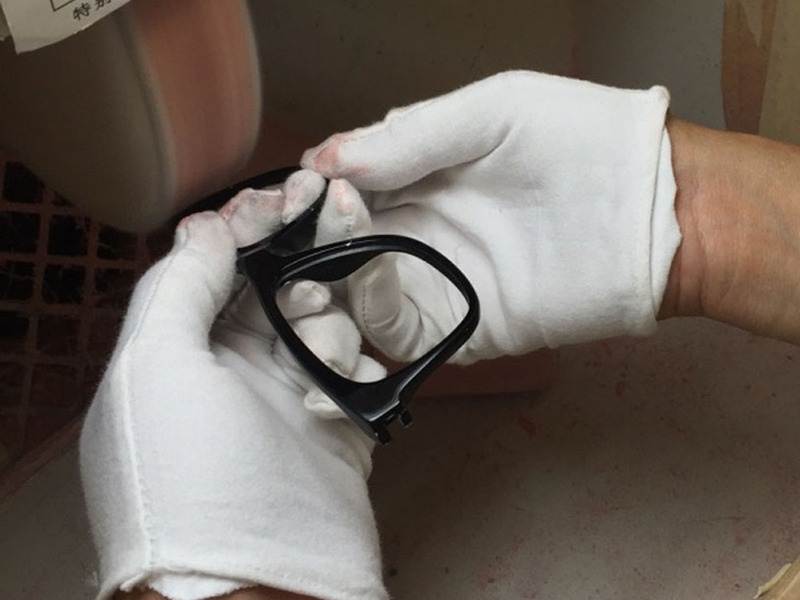 The worker hand-scrapes the acetate to make the temples thinner. Some would shrug and say, “Everything is made in China nowadays,” and accept it without a second thought. Some freeze up, worrying about blurting out something politically incorrect. With so much negative media coverage dealing with questionable products made from shady factories, I can understand their hesitation. The mistrust towards Chinese produced goods is deeply ingrained into the consumer’s mind. After all, most of these people will never step foot inside a factory to inspect the quality of the goods themselves, especially not the ones across the globe. If all you ever hear is the negative portrayals on the news, then of course you would be critical. The worker buffs the face plate, smoothing out the rough edges. And because of the media bias, most people will never know that the ones really responsible for those shoddy goods are the buyers from American companies. I’ve heard with my own ears, more times than I care for, stories of obnoxious buyers from big companies that bully their way into better deals with the factory. They will place orders for ginormous quantities, and insist that the factory slash their prices in half to accommodate them. Most factories have little choice in the matter, as if they refuse to do business, hundreds of thousands of workers may lose their jobs. But something will have to give. 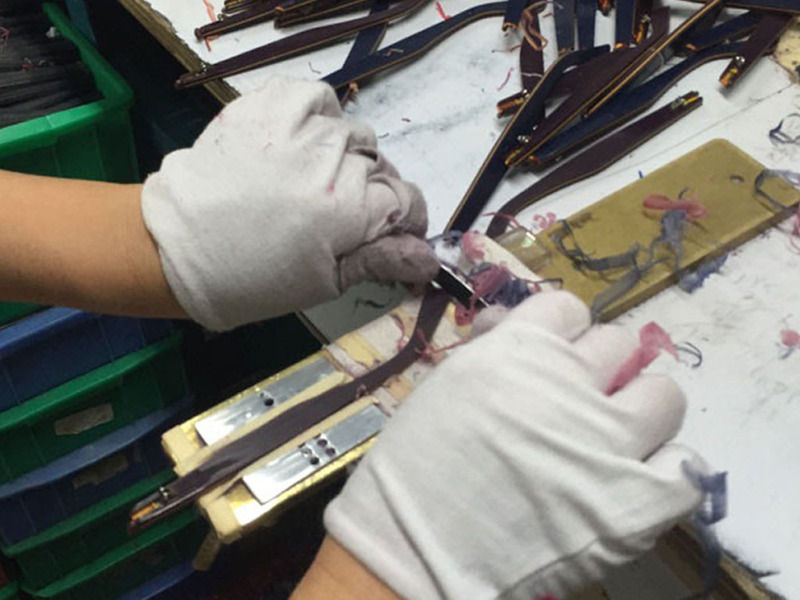 The factory is placed under strict time constraints, so they can’t take longer to finish the order. The price range is non-negotiable and at the end of the day they will still have to pay all of their employees. The quality of the materials is the only thing that can be sacrificed to appease the buyer’s outrageous specifications. The worker uses a calligraphy brush to clean around the hinges. Lower quality products do not concern the buyers. The only thing they care about is maintaining their profit margins, and returning back to the boardroom with a beautiful spreadsheet detailing the amazing deal they just secured. So long as they can supply blockbuster stores in the first world countries with cheap goods to feed the insatiable appetites of the typical consumer, they will do whatever it takes to make it happen. Then my question is, who is to blame? The factories? The buyers? Or is it the consumers that only want cheap products? The same people who are wary of Chinese-made products often forget that the iPhone in their hands was also made in China. So are their solar panels, the $3000 flat screen TV, the satellites, and their beautiful buttery leather jackets. The factory that produces our collection is the same I collaborated with for fifteen years while working with 30+ European collections a year. 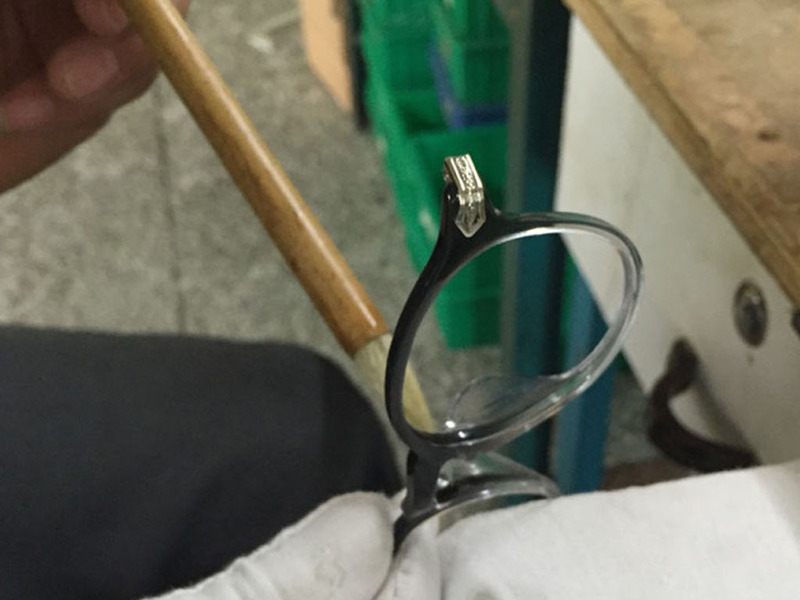 It is a second-generation frame maker, and the founding father, who is over 78 now, started making frames when he was 17 years old. 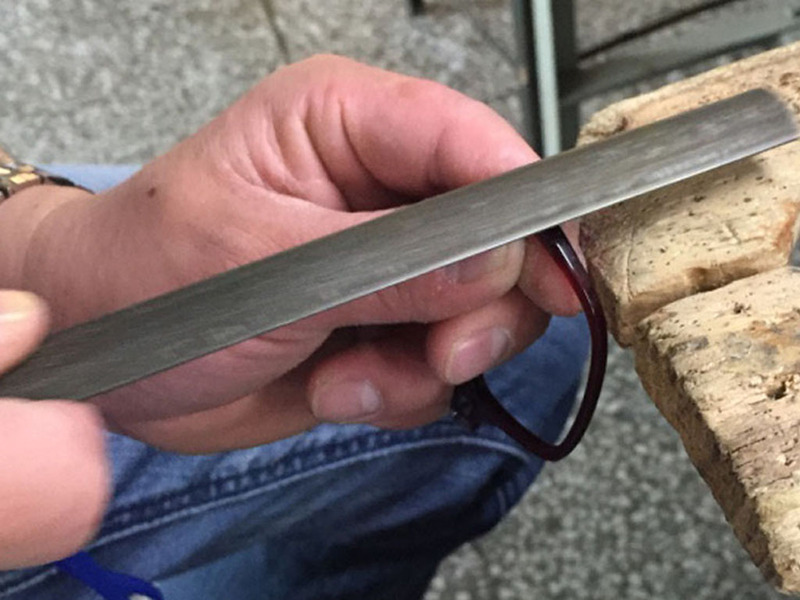 As a young apprentice, he would fallow his shi-fu from Shanghai to Hong Kong, sitting behind a little window taking measurements and handcrafting each frame from real tortoise shells. He kept a small operation for over four decades, until his three grown sons returned from their education in America to take over the family business. The worker files and polishes the end piece. Once, I was approached by a representative from a European brand. He noted the quality of TC CHARTON, and said that other brands of similar quality would price their products $100 higher than ours. He didn’t know how we could afford to price them so low. By directly shipping from China to the USA, we don’t have to increase our prices to pay for detour shipping and custom duties. This allows us to pass the savings onto our consumers. I used to be part of this unethical “country of origin” game. But now that I have full-control of my own collection, I refuse to deceive the consumers. I also want to give credit where credit is due. These exceptional artisans and craftsmen deserve recognition for their work. I want to tell everybody through my products that there are GREAT Chinese factories out there, and that they produce some of the most beautifully crafted products I’ve ever seen. Why should the Europeans get all the credit when these Chinese workers are the ones who did all the dirty work? The frames are washed, rinsed and set out to dry before being packaged. That being said, it is undeniable that the European optical component companies still produce top quality parts and materials. 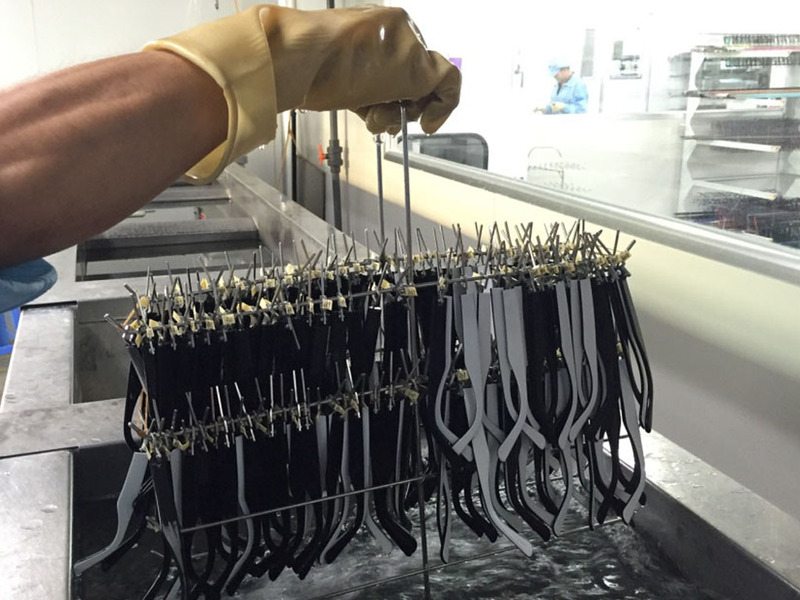 We use German stainless steel, Italian Mazzucchelli acetates, French COMOTEC and Austrian REDTENBACHER spring hinges. But, besides the parts and materials, the thing that truly distinguishes a beautiful acetate frame from a mediocre one is the craftsmanship. There are bad apples in every industry, in every country. But there are also some state-of-the-art facilities across China that are so well-managed, so skilled, and so technologically advanced that they have to be run by some of the very best experts, engineers, and artisans in the world. Just like the factory that produces every single piece of our collection. Top notch components and skilled craftsmanship. I believe we have the best of both worlds. And yes, they are made in China.